Like Gossip, Scissor Sisters are another one of those American bands that are criminally underrated here at home but hugely popular abroad. The drastically different radio landscapes here and in Europe frustrate the hell out of me sometimes, but what are you gonna do? 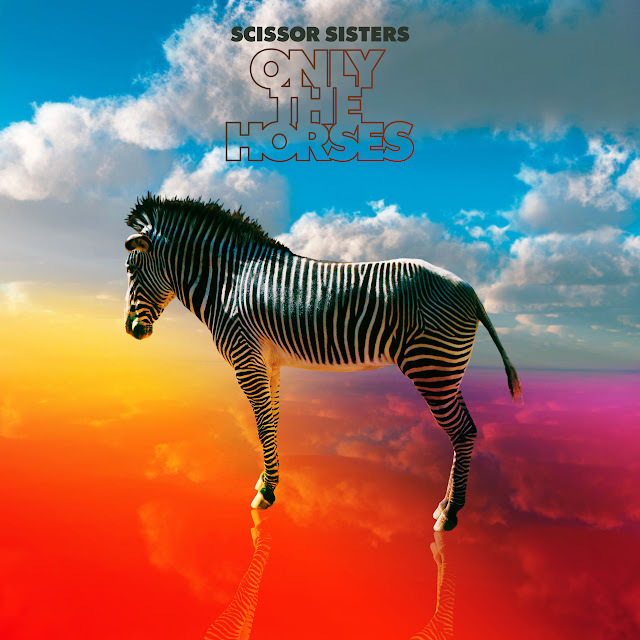 On May 14th, Scissor Sisters will release "Only The Horses" as the lead single off their upcoming fourth studio album, entitled Magic Hour (check out the album artwork HERE). Written by Scissor Sisters and co-produced by Calvin Harris and Alex Ridha of Boyz Noize, "Only The Horses" presents as a welcomed return for the band, who's last album, Night Work came out two years ago sans any real, honest-to-goodness hits. While the album itself did moderately well, debuting on the UK Albums Chart at #2 and in America on the Billboard 200 at #18, it failed to produce a real hit single. The closest we got to a hit was with lead single, "Fire With Fire," which peaked in the UK at #11. As nice as it will be to have the Scissor Sisters back on radio (hopefully), I have to admit I have yet to be completely bowled over by any of their new material. "Only The Horses" is a welcomed return, yes, but only in so much that it's nice to hear from the group again. The single is fairly generic dance pop, sounding much like a leftover cut off of Kylie Minogue's 2010's stunner of an album, Aphrodite. While vastly superior to the the band's originally planned first single, the Azealia Banks-assisted "Shady Love," I was kind of hoping for and expecting more. In addition to Calvin Harris, Magic Hour features collaborations from Pharrell Williams, Diplo and others. Says frontman Jake Shears of the new album, "It's a sweet joyful mélange of beat-driven future-pop. It style-hops all over the place unabashedly." No kidding! While "Shady Love" is heavily influenced by hip-hop, "Only The Horses" is straight up future-disco dance-pop. I hope that the album pulls together these different genres into a cohesive unit, because what the Scissor Sisters do not need right now is a mix and match album with no flow. I'm optimistic that the band can pull it off. Here's hoping that they do. Since releasing their debut album in 2004, Scissor Sisters (AKA Jake Shears, Ana Matronic (vocals), Babydaddy (different instruments), Del Marquis (guitar/bass) and Randy Real (drums) have sold over 4.5 million albums in the UK, with both the band's self titled debut as well as their follow up, Ta-Dah hit #1 on the UK Albums Chart. Scissor Sisters will play shows at New York City's Bowery Ballroom on May 6th and at Shepherds Bush Empire on May 16th and 17th previewing songs from the new album as well as a collection of past hits. "Only The Horses" is out May 14th, followed by the release of Magic Hour (Polydor Records) on May 28th in the UK (US release date TBD). Look out for some hot remixes of "Only The Horses" from Calvin Harris, and Max Sanna & Steve Pitron. and stay tuned for the video which is set to premiere this Thursday, April 19th at 11:00 AM UK time on VEVO (check out this 'Behind The Scenes' clip). Check out the lyric video for "Only The Horses" BELOW and download Scissor Sisters on iTunes.